For major events, Vidsys provides Physical Security Information Management and converged security software to Houston’s Office of Public Safety. Annual events like the Super Bowl attract massive crowds that create logistical, safety and traffic challenges on an enormous scale. 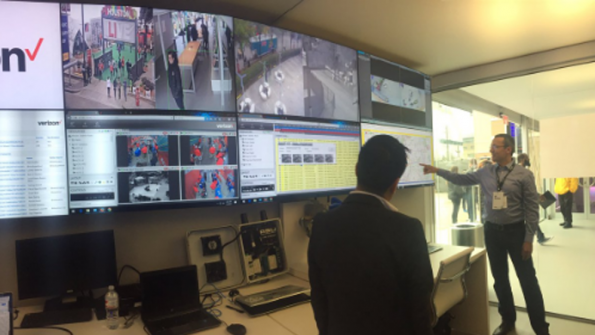 As part of an ongoing partnership with Houston, Vidsys provided Physical Security Information Management (PSIM) and converged security software to Houston’s Office of Public Safety. The IT platform and system pulled in data from sensors, ID management, video, access control, alarms, IT systems, social media and other Internet of Things devices to help manage risk during Super Bowl LI. The company’s technology allowed Houston officials to share video and other important data with security teams around the city. The teams included police, fire, the Houston Emergency Center’s Office of Emergency Management and Real-time Crime Center, other public safety agencies, as well as major venues (stadiums, the convention center, medical centers and others). In the photo to the right: NRG Stadium in Houston, Texas. Super Bowl LI was played at this venue. The platform collects, analyzes, verifies, resolves and tracks data from multiple, disparate subsystems using open architecture standards to help manage situational risk. Vidsys’ software works directly with special response groups to connect them with command center communications and video footage. This enables increased collaboration and allows authorized users to view and manage situations in real-time. To enable monitoring the large crowds, Houston installed a large number of new cameras that had to be quickly integrated into the system. The browser-based platform in the security setup simplified installation of the cameras, which were installed within a matter of days. The Vidsys platform enabled creating a single user interface where city agencies quickly communicated and collaborated. Under the old system, Houston’s public safety agencies rarely shared data and tactics. “Houston is fortunate to have hosted a number of important events, including Super Bowl LI, that have presented significant challenges for public safety,” says Jack Hanagriff, coordinator of the Regional Risk and Critical Infrastructure Protection Program. “Vidsys is an important piece of our public safety strategy, and is unique in that it supports a variety of government agencies charged with protecting Houston’s citizens.” The Super Bowl gridiron classic took place Feb. 5, 2017. Houston has been working with Vidsys for the past 11 years and installed the Vidsys platform in the summer of 2010. Go here for more information on Vidsys.